Learn three easy Audacity tips for making your voice sound better, regardless of what microphone you use. Don't worry, I didn't record the whole podcast in a pirate voice. Even if you use a cheap or built-in mic for your podcast, you'll get a better sound if you can be 2–3 inches away from it. You may have to reduce your input volume when you do this. Being closer will reduce the room reverb, reduce noise, and capture more of your voice. Equalization increases or decreases the volume of certain frequencies of sound. Use the EMI 78 present in Effects > Equalization to easily enhance the quality from a cheap microphone. If you're missing this setting, download “‘record' EQ settings” and follow these directions to install. Compression essentially evens out the volume of your audio. I recommend Chris's Dynamic Compressor. The exact settings for your audio will vary, but I've found that these settings work quite well on most recordings. Normalization's most popular use is to increase or decrease your audio so that the loudest point is at a certain level. I recommend -1dB. I now offer a free email newsletter for podcasting tips and Audacity tips. From the same sign-up form, you can also receive email from our other podcasts. TATP #50 was interesting even to a listener with a good mic. (We have two ElectroVoice RE20’s, the standard mic in most radio studies in the U.S. Even Cliff admitted [in writing!] that it was comparable to his beloved Heil PR-40, though more expensive. As they were gifts, we found them much less expensive than the Heil!) I use the Multicomm Pro-XL compressor/limiter/gate at the Ravenscraft-prescribed settings, but I wonder if I’m getting enough compression. I speak only an inch or two away from the mic, and certain words and “plosives” (even with a double pop filter) spike the sound levels to near-clipping, keeping the db level uneven throughout. That being the case, I’m wondering if it would be better to fiddle with the hardware compression settings further (though I don’t feel I know enough about the three middle dials — even after reading the manual — to experiment intelligently), try your suggested Audacity compression plug-in, or work at it from both directions. Your thoughts would be appreciated. Thanks! I'll continue using my hardware compressor/limiter/gate and add the software compressor back in. Cliff still software-compresses his audio, too. I guess I’ll have to experiment, adding software compression to the mix, and then going back to tweak the hardware compression if necessary. 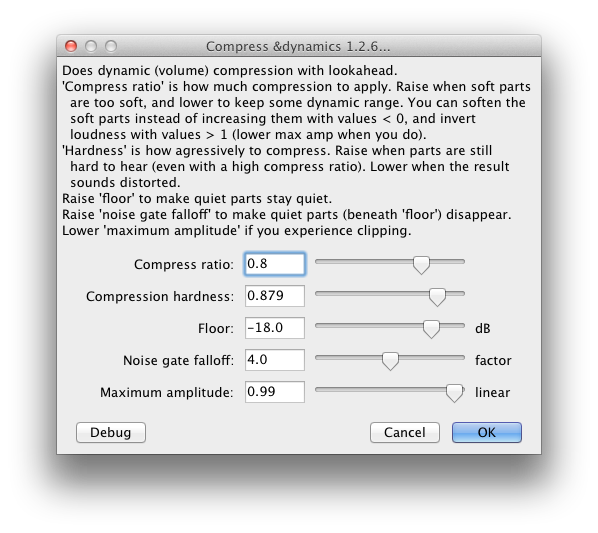 I could be wrong, but I think Chris's dynamic compressor is now included by default in Audacity 1.3.12-beta. After installing the version from your website, this is what I found on the Audacity menu system – http://kernelsofwheat.com/ccc-menu. Your (Chris's) version looks like this — http://kernelsofwheat.com/cdc-old. What is apparently the new version has the same five options, but adds two more — "Compress bright sounds" and "Boost bass sounds" — http://kernelsofwheat.com/cdc-new. I apologize for the "Pretty Links," but I didn't see an option to upload screenshots. No, Chris's Dynamic Compressor is not included with Audacity. You must have already installed it. In the file I'm hosting, I added the version numbers. The "compress bright sounds" and "boost bass sounds" are options added in the 1.2.7 beta that Chris never finished. There are some bugs with that version, which I'm getting help to fix. As you can see from the first link above, I have a boat-load of plug-ins, which must have been added as a batch. But when that happened, I can’t remember. You mention bugs in 1.2.7 — are these related to the new features, or do they also affect the functions from 1.2.6? Danny, just wanted to say a big WELL DONE for making it to the epic half-century point. 50 is no slouch and you deserve praise for what you're achieving here. Congrats, buddy – and here's to many more. I just found this podcast, I'm very interested in the audio production topics (like this one). I loved your invitation to send in samples. I'm just launching a family audacity project, in which different folks will be reading the parts to a chapter from winnie the pooh. The first to record has been my 5 year old, Julian. Given the range of ages, genders, and levels of experience that my "talent" will exhibit, I've been wondering about whether I should do this kind of editing to each part, then mix them, or try to edit a mixed whole. I'm leaning toward improving each track through your equalize-compress-normalize and *then* try to mix them. BTW, I'm using a Samson Gtrack into audacity running on a macbook pro. Any suggestions? Would it make sense to send you a short clip of my little guy, before-during-after, or wait till I've got all the parts on board? Thanks for subscribing and welcome, Ian! Yes, I would suggest processing each voice differently, especially when you'll be recording people not as comfortable or experienced behind a microphone. While the same settings may generally apply to everyone, you may have to tweak for some people. Chris's Dynamic Compressor does not affect every second of sound the same way. This is why it's dynamic. It will amplify one second of sound while de-amplifying another. But the values you tell any compressor to use will sound differently on different voices. Take notes of what you find works best. On this topic – should I be processing my voice first then adding the intro outro and normalising the whole finished episode? Oops. This is a time where I incorrectly assumed the same thing was on the Windows edition as on the Mac side. Thanks for the correction and link. Thanks to the advice in this post, episode 1 of the BitBattle podcast has been released. It started as a "Why not? I've got an hour to kill". It doesn't match the quality of the "big boys", but it's mine! (it actually didn't turn out too badly for using a $5 microphone and free software) http://bitbattle.podbean.com . By the way I even got it listed on iTunes. Sounds good NJBrad. Mild mannered IT guy, I like it. WIth the new 1.3.13 Beta the compression screen looks different without some of the options and has different ones than what you show on your 1.2.6. This makes it so i can not use Chris’s Dynamic Compressor. The options I have are Threshold, noise floor, Ratio, Attack Time, and decay time. Any ideas? Thanks for the comment, Wally. You're looking at Audacity's built-in compressor (Effects > Compressor). But Chris's Dynamic Compressor (Effects > Compress Dynamics 1.2.6 (may not have a version number) …) has the options to which I refer. Do you have any suggestions for using the built-in compressor. 1) I would like to use it as part of a chain and I don’t see that as an option using Chris’s Dynamic Compressor and 2) if Chris’s isn’t maintained any longer I wonder about the compatibility of it with future version of Audacity. I think that Chris’s Dynamic Compressor does a better job than the built-in compressor. However, stay tuned for my next episode (#65), which will compare the built-in compressor, Chris’s Dynamic Compressor, Levelator, and maybe even the C3 Multiband Compressor. Ah, Perfect! Thanks you for the help. Learned everything I need to know from ya! Keep up the great work! One issue with Chris's Compressor is that the if the original volume of my recording is low it doesn't seem to work properly, it keeps fading out the ends of my words. This is a common problem and I run into it sometimes, too. There are two ways that you could try to fix this. 1. 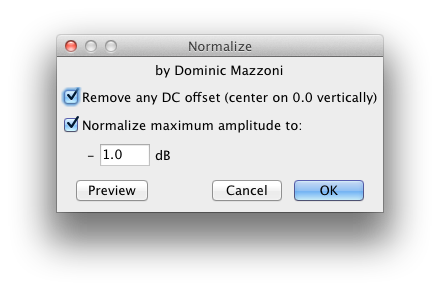 Normalize to -1 db first. Note that the value is already negative, so you just enter "1," not "-1." But this will increase the volume of your noise, too. 2. Remove the "Noise Gate Falloff" or lower the "Floor" in Chris's Dynamic Compressor. Let me know how these work for you. I found getting rid of the noise fall of really helped. Then I just removed the noice using another effect. Am new to podcasting and i need help to get started. I order a podcast mixer from technicalpro which comes with a microphone, headphone and a CD to download the program. Been playing around with it did some recordings, delect them just to get comfortable with the appliance and the system. Today, i did the same as usual but as i unplugged the mic mistakenly it kinda corrupted the dashboard. Can't play, the lines are not moving as they normally would and can't hear the sound anymore. When i press play it will but wouldn't produce any sound. Whan can i do? Sounds like something you'll need to talk to them about as you're referring to a system I don't recognize. I'm sorry I can't help more. I can’t hear what I am recording when I play it back. Not sure if my Samson microphone is not connected right. Did it a few years ago without a problem. Any ideas? Do you see a waveform in Audacity? Try lightly tapping on your mic to see if that’s reflected in the recording. If it looks like Audacity is recording, but you just can’t hear it back, make sure you have the right output device selected from the drop-down menu next to the speaker icon on the Device toolbar (Audacity 1.3.13 and later). Mr. Lewis, first, thank you for the show. I recently discovered The Audacity to Podcast, and since I too am a podcaster who uses Audacity, I have found your episodes to be very informative. Second, I do have a question about episode 50: are you recommending we process the audio in the order shown in the notes (equalization, compression, normalization)? Generally, yes. But it depends on your audio. Normalization may not be necessary if the compression worked well on good audio. When I record, there is a weird phantom static hiss. It’s even there when no microphone is connected. What is this and how can I fix this? Also, when recording, what my mic picks up is really faint, but recording on another computer with the same mic it sounds just fine. Help? What kind of mic? What kind of cable connecting to your computer? What kind of computer? It’s a cheap headset I got for free. The computer is a four or five year old gateway laptop with windows 7. I just use the regular mic and headphone jacks that are on the front of it. From what I’ve seen, its not the mic, its the computer. Yes, it’s the computer. 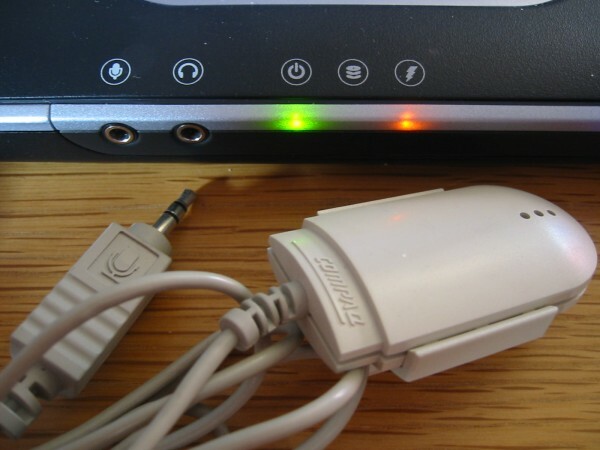 Analog input (the 3.5 mm mic jack) is highly susceptible to all kinds of noise and interference. That’s why I recommend a USB interface. You can buy an audio adapter from Amazon.com for really cheap, and it will probably solve your problem. Normally, recording without the mic plugged in reverts to the built-in mic. Do you actually hear the hiss, or do you only “see” it? I have tried the USB before, but it just makes the static a little more choppy. That could be due to the processing power that USB requires. An older computer running several apps wouldn’t be able to handle it. The one and only time I had a failure recording into my PC was exactly because of this: I was straining my old PC and running a CPU-intensive app. This left little CPU for the USB interface, so my recording was choppy. Thanks for a great article and for hosting Chris’s dynamic compressor. 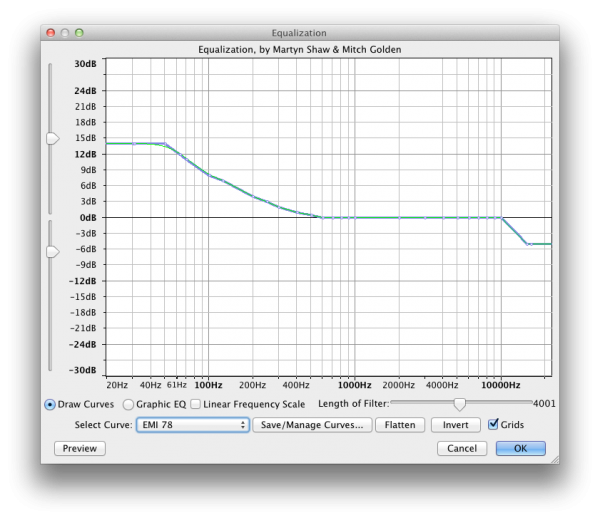 One question, though… What’s the rationale behind using the “EMI 78” EQ curve before applying compression? On my recordings, this EQ curve certainly increases the bass volume, but also makes my voice sound muffled and less “crisp”. Is the EMI 78 EQ curve just intended as a quick fix for cheaper mics with poor bass response? Yes, the EMI 78 EQ is better for the cheap mics, but unnecessary on nicer mics. The reason I suggest running EQ before compression is that compression will raise your volume to a certain level dynamically, but EQ does it arbitrarily. So you would risk clipping if you compress before equalize. For example, let’s say your raw audio peaks at -2 dB. EQ may raise that to -0.5 dB. When you run compression, it evens it back to -1 dB. But doing it the other way around, compression may even it out to -1 dB, but then EQ will raise that even further to +0.5 dB and thus result in clipping. Just a quick thanks for this guide, it has made a huge difference tony vocal recordings. You’re welcome! What kind of mic are you using? Hi, just an iRig Mic Cast on my iPad. Has made a definite difference, but will continue to play around with settings to see if can improve further, seeing it is a cheaper mic. The Compressor is extremely useful! Together with Normalize – wonderfulness! 😀 Thank you so much. Now, my blogcast will sound much better. Thank you Daniel, this podcast is great & informative for a noob like me. Thanks for this! I listen to your OUAT podcast, and stumbled on this one when I was trying to get some tips to make a better recording for a class I’m taking. I’m using a different version of Audacity, but I was still able to use the tips this gave me. I’m now subscribed to your newsletter! Great crisp discussion with clear specifics for a wide use case-cheap or built-in microphones. Thank you. I see it took you a bit to get to your round of compression reviews in episode https://theaudacitytopodcast.com/tap065-audacity-compressor-showdown/ where we can see you obviously put a lot of time and effort to really compare the different alternatives. Would you still feel Levelator is the best today compared to the current version (2.1.0) of Audacity? I have no idea if they even touched the compression / normalizing effects. But my voice is muffled and I need it to be clear for my Innocence(Hatsune Miku) cover. It’s very important. thanks again for all your help. I regularly return to this page when I am trying to figure out my weekly editing snafus. Where in this process should I be using the Noise reduction? Thanks! Ideally, noise-reduction should be before most other processing, especially compression. Normalizing, however, is okay for before noise-reduction, because normalizing raises or lowers everything by the same amount.